There are 80 mares in foal – to stallions such as Dundeel, Rubick, Deep Field, Star Turn, Astern, Cable Bay, Pariah, Winning Rupert and Highland Reel – plus 15 mares with foals at foot, seven of which are back in foal. Queensland-based sire Wanted is offered for sale in the stallion category, having enjoyed a successful few seasons standing at Clear Mountain Fairview Stud. 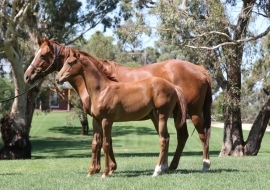 Wanted’s Stakes-winning progeny include G1 South Australian Derby winner Leicester, Dead Or Alive and Vital Silver. The March catalogue also includes 116 racehorses, 33 yearlings, seven weanlings, two unbroken fillies and three racehorse shares. Exciting young stallions like Brazen Beau, Maurice (JPN), Zoustar, Dundeel and Time For War are represented in the yearling and weanling category. There are also multiple entries from operations such as Arrowfield Stud (12), Coolmore Stud (8), Lindsay Park Racing (8), Rosemont Stud (8), Watershed Farm (8), Abby Downs (6) and Rushton Park (6), among others. The catalogue is now open for bidding; those without an Inglis Digital account can register to bid HERE. The final countdown of bidding starts with Lot 1 at 5pm AEDT, Wednesday, March 27. Prospective buyers are encouraged to conduct inspections and relevant vet checks over the next five days. CLICK HERE to view the entire catalogue. Note: Entries for the Scone Online Sale which replaces the mixed sale at White Park, close on April 30.